How did holding your pen or pencil in a different way affect your drawing? By holding near the bottom of the pen or pencil you allow yourself more control when making marks giving you more precise lines and the control to add more pressure if and when needed. Holding a pen from the top or ‘dangling from the top’ creates less controlled, lighter marks but and can allow you to fill larger areas at a much quicker pace. By holding the pen with finger pushing down on the tip you create broad heavy strokes that are both dark and smooth. 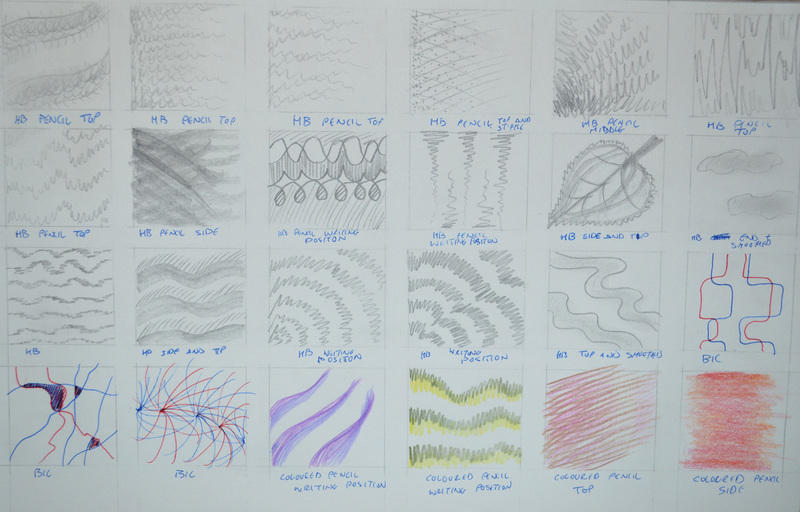 Which drawing tools suited the different mark-making techniques you used? For shading the best tools in my opinion are soft pencils, solid graphite pencils, graphite sticka and charcoal. Pencils, fine drawing pens, ball points and also coloured pencils are great for cross-hatching; felt tips may also be good with a bit of practise and knowledge of which is the best paper to use with these. However felt tips are great for stippling as the ink soaks into the paper quickly to leave a strong dot, drawing pens are also great for stippling. Did you find that any marks or tools you used matched particular emotions or feelings? Did one convey calm and another frenzy for example? This is difficult to answer, one can convey calm with tools such as soft graphite pencils, graphite sticks, drawing pens and charcoal by making regular marks, smooth lines and strokes with soft edges but then the same tool can conveyed frenzy when used in a different way on the large sheets of paper. I found that the nib (dip) pens were quite scratch and so probably created a more negative mood. 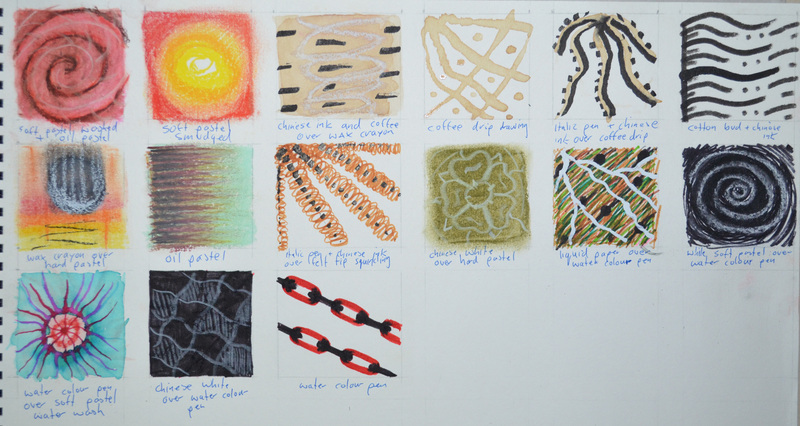 How did the introduction of colour (soft pastels, Conte crayons) affect your mark making? Introducing colour especially soft pastels, Conte crayons, wax crayons and hard pastels was distracting because it made me realize I really need the practise and so spent more time trying to get things right than being creative. However once I had used them for the first time it left me wanting to use them more. Which of these experiments you found most interesting and rewarding? 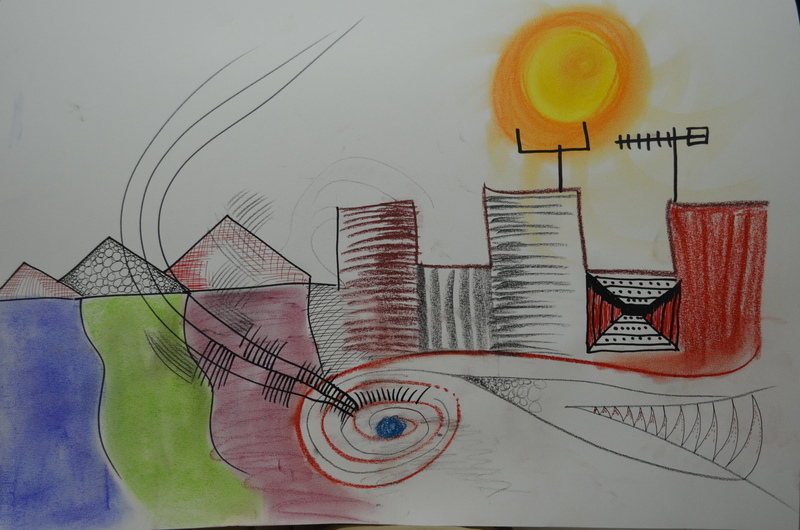 Definitely the Line and Other Marks exercise, it introduced me to colour for the first time plus tools that I had never used before as well as finding out how different mediums react to one other. I chose this picture because it is a great example of how Van Gogh uses very simple marks to build up an intricate scene. The types of marks that he uses such as squiggles, dots and dashes are very clear in the picture and yet the image still has great volume and texture. For the sand in the foreground Van Gogh uses small squiggles that almost resemble tiny letter m’s while for the boulders that separates the sand from the grass he has used larger more irregular shapes with squiggles and circles to indicate erosion marks in the rocks. Van Gogh used different line lengths for the grass with short, close to vertical dashes for the shorter grass while the longer grass is made up of longer and sometimes thicker strokes drawn at different angles to give a sense of coarseness. The smaller bushes and trees are made up of curved lines as is the bark of tree in the middle, however, he seems to have used a very loose form of squirkling (connected squiggles) for the leaves and branches of the tree in the middle. He has also gives the viewer a sense of distance when looking at the tree on the right of the picture by drawing long vertical lines that depict a distant field, while the colour of the ink in the rocks in the foreground is much darker to give a sense of closeness. The clouds in the sky seem to be made up of long thin zigzags while the bird flying in the sky is has been drawn with two short thick strokes. It really is inspiring to see how such simple marks can make up such a complex image and I can’t wait for the opportunity to occur when I can do something like this. 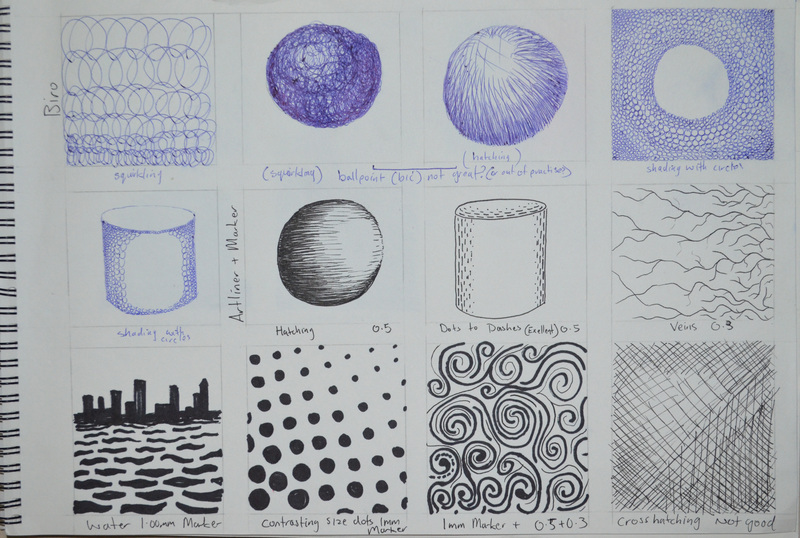 The object of this exercise was to draw lots of 5 cm squares in my sketchbook and fill them using pencils and pens practise several different marks in each square, thinking about intensity, texture, smoothness, pattern, length and repetition. Now after reading the words ‘practise several different marks in each square’ there was a danger of either turning this exercise into another ‘Doodling’ exercise or making the squares look like swatches for a textile course. I wanted to avoid both so I looked a few different existing OCA Drawing 1 blogs to see how others had tackled this exercise. The benefits of other students having their blogs online is that you can see how others have gone about completing each exercise, the drawbacks of this is that one can go look at someone’s blog and then feel a little bit restricted for risk of going too close to someone else’s work; but then it does force uniqueness or at least it did with me. The materials I used for this exercise were, pencil, coloured pencil, bic, water soluble pencil, solid graphite pencil and graphite sticks as well as charcoal, Chinese ink, nip pens, marker, whiteboard marker, ArtLiner drawing pens and Chinese white pencil. I found that I used the HB pencil a lot until I came out of my comfort zone, it’s a tool that’s easy to rub out if I’m not happy with what I’ve done but then I realised at this stage I should allow for going overboard or getting sloppy as it is those little mishaps that will help me ‘learn’. I also found that I kept going back to shading and the hardest part of this exercise was trying not to repeat anything I had done in earlier exercises. As I tried to move onto different media I kept realising that there were still other marks that I could do with pencil. Holding the pencil in different ways and at different angles gave me different effects, holding it in a writing position I created smooth, strong lines while holding it at the end gave me uncontrolled, sometimes smooth but then sometimes rough lines, depending on the direction I took. Creating patterns through repetition was not only great for conveying a feeling of depth but was a good transition point to help me to move on to using other media, otherwise I could have been there all day (just a figure of speech, this actually took me three evenings). With the size of the squares (just 5 cm) I spent a lot of time practising on large sheets of paper not having the confidence to go straight into my sketchbook with the softer mediums such as charcoal and the messier mediums like ink. Nib Pens – This time I had a lot more confidence with nib pens knowing exactly how much ink to put on them and how to ‘put pen to paper’ and what direction is best with each nib to give me different lines. I used two different nibs, 1 Italic which was nice and smooth and 1 very fine nib which was very scratchy and didn’t feel that comfortable with but it was great for doing the Khmer style marks in the third photo. Too be honest I wasn’t that eager to move onto other mediums, but once I did, I really started to enjoy myself. I was limited to what I had, it might take me forever to find a descent quill in Bangkok, but a walk in the communal garden on the 5th floor got me a leaf and a stick. The new media I used for this were watercolour pens, water soluble coloured pencils, water soluble graphite pencils, coffee, drawing ink, hard pastels, oil pastels as well as wax crayon, solid graphite sticks, UHU glue, liquid paper and a Derwent Chinese white pencil. I also used several different drawing tools including a scrunched up tissue, nib pens, a stick, a leaf, a toothbrush and a straight razor plus a couple of new techniques such as drip drawing and washing over several of the new mediums with water and a fine brush. It took me a good few squares to really get into this but my hunger for new mediums really started when I drew with the stick dipped in Chinese Ink, with just one stroke of the stick I made both thick strong lines and thin whipping lines which were both chaotic and rhythmic. I had the idea of washing coffee over UHU glue while I was at the gym for some strange reason but I’m glad I did. 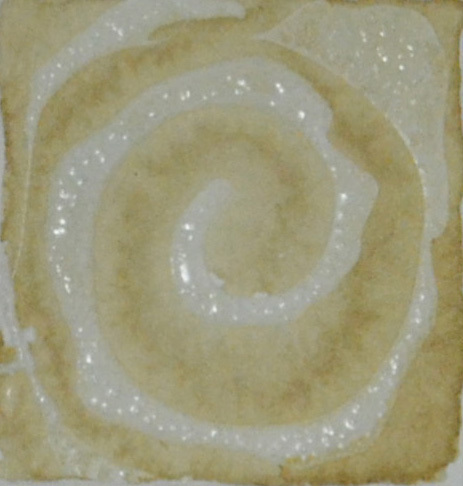 I could have created many different patterns by doing this and practised a few times on large sheets of paper but the easiest one given the size of the square was the swirl which created a wonderful blended effect. Even after practising on large sheets of paper when it came to repeating it in the squares on my sketchbook I still messed up. The solution to this was either cut the successful practise from my large sheets and glue it into the squares or to try and make something else of it. When I tried brushing sideways with the toothbrush dipped in drawing ink I got nothing but a large dark grey surface, determined to get something out of this I attacked the surface with a straight razor. The result of this was very raw but it is something I can use later. I got some great results washing ink over wax crayon and in some ways it looked like the negative of a drip drawing which I also successfully pulled off in both ink and coffee. I also really enjoyed the watercolour pens that I have been using as felt tips which gave me some great oil type patterns when drawn with on a wet surface, and drawing with liquid paper over mixed coloured felt tip lines produced very dramatic white lines. 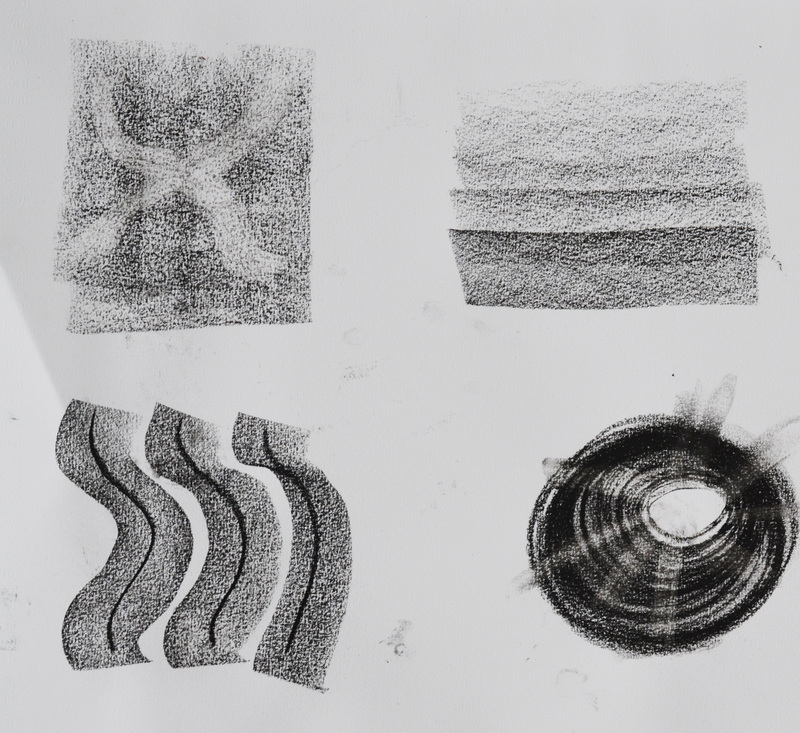 In this exercise ‘Using Charcoal’ I experiment drawing lines of varying thickness, doing blocks of shading in different grades of darkness, creating patterns as well as using my putty rubber to create highlights. 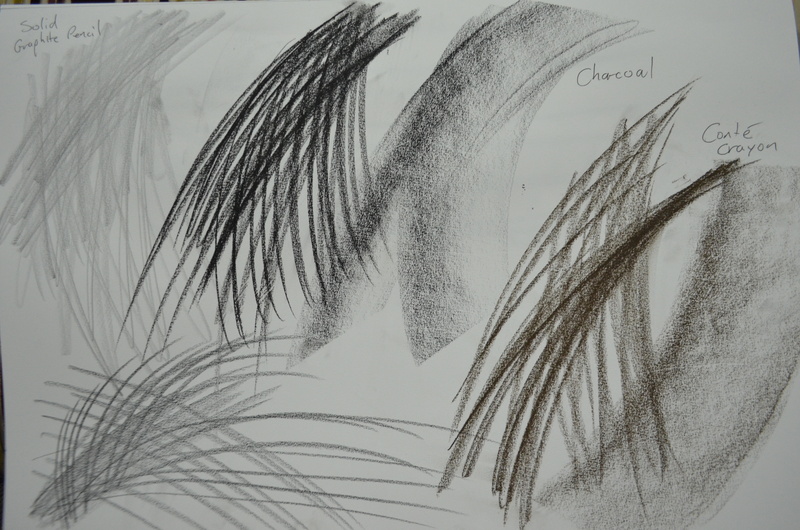 I hadn’t used charcoal before starting this course and so was was eager to get on with this exercise as charcoal has some very appealing qualities. 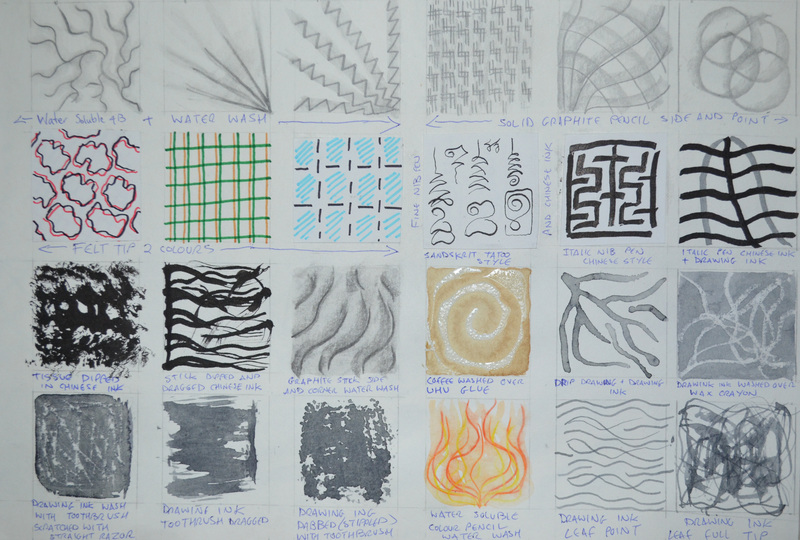 However the first lesson I learnt is that the patterns you create with the same stick of charcoal change according to the paper you are using it on. Before filling up the squares in my rough 150 gsm sketchbook I practised on a smooth 125 gsm large sheet of paper and as you can see below the outcome was completely different, especially with the charcoal being able to be smoothed more easily on the large sheets of paper. Another valuable lesson I learnt was that if there are any indentations paper in the caused by pencil on previous pages these will show up in the charcoal so you should start any work with charcoal on a fresh sheet. 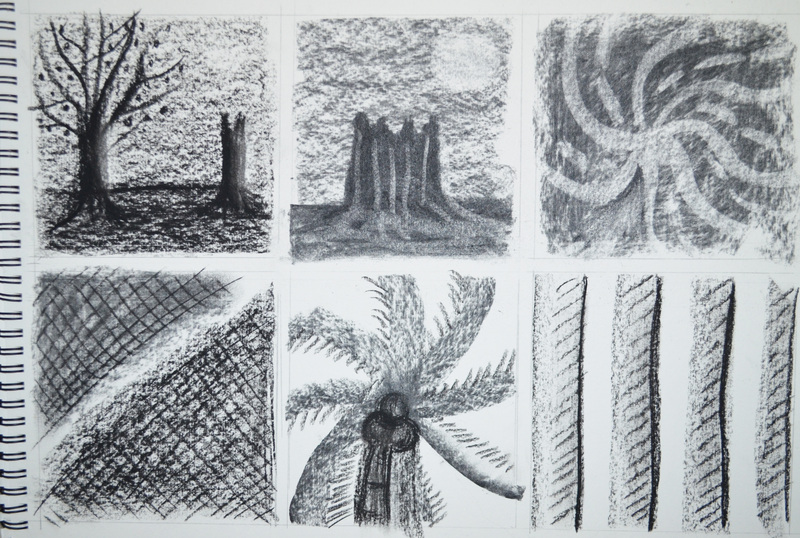 I started this exercise with compressed charcoal not actually knowing the difference between the two types of charcoal I purchased or the different qualities they had. On the smooth paper the compressed charcoal produced smooth dark strokes that could be smoothed with the finger quite easy but on the rough paper the texture reminded me more of a wax crayon with less contact and more white space. I also had trouble producing defined highlights with the putty rubber on the rough paper. Using the edge of the tip of the compressed charcoal I could create a nice hatching effect over different shades of darkness as you can see in the bottom left box of the image below. On the next page I filled in the first square again using the compressed charcoal before opening the second packet of charcoal I bought discovering it was what I now know to be willow charcoal. 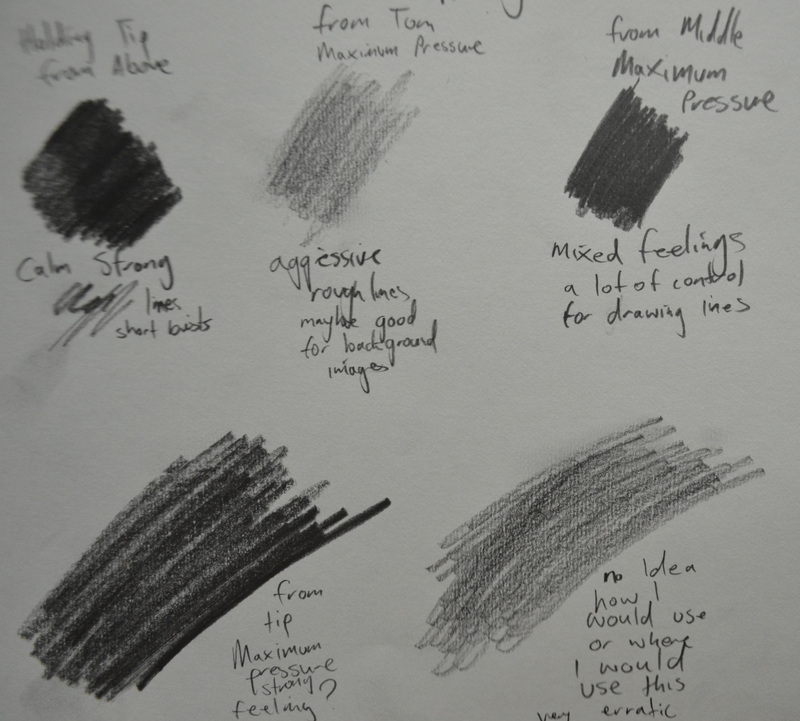 Willow charcoal is a lot lighter and a lot softer and worked well on the rough paper of my 150 gsm paper of my sketchbook, allowing me to use my putty rubber more easily to give me more defined marks. 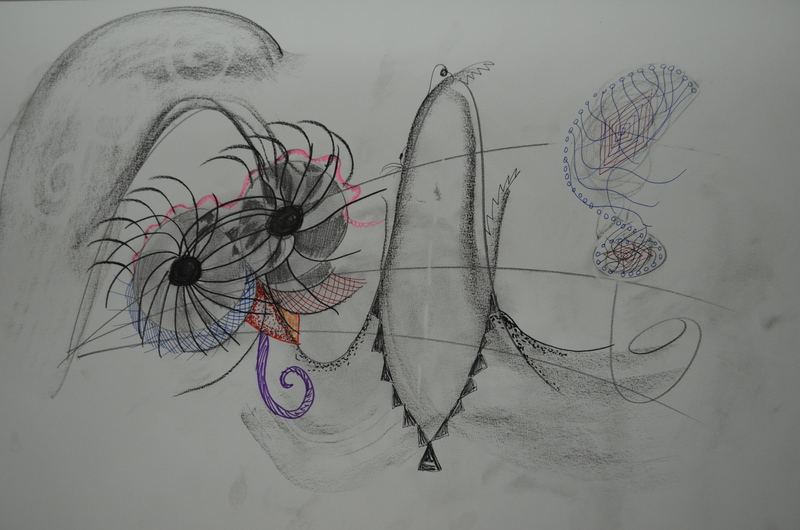 Overall I like working with charcoal it can be very expressive and some of the patterns I created with it were almost 3D. I don’t think that it is so great for small detailed images but rather an excellent medium for drawing large scale images, both compressed charcoal and willow charcoal have a wonderful soft texture on all be it a different tooth of paper. I did also used a charcoal pencil for certain detail such as hatching, I have yet to make up my mind whether this would be great for small scale detailed drawings with charcoal. This exercise of trying out various media and various techniques to see which mark making techniques work with best which media, was great for reintroducing me to techniques that I hadn’t used for quite some time. The media I used for this exercise were a variety of graphite pencils, colour pencils, felt tips, Bic biros, Art Liner drawing pens, a 1mm Marker and Charcoal; plus a number of mark making techniques such as hatching, cross hatching, stippling, squirkling and point and side shading. I hadn’t used many of these techniques for a number of years so I was a bit rusty and need more practise with each medium. My favourite medium at this stage has got to be pencil and so I began this exercise using various graphite pencils. However I soon learnt that I have a lot to learn about pencil usage and narrowed my choice of pencils down to 2 to 4B. 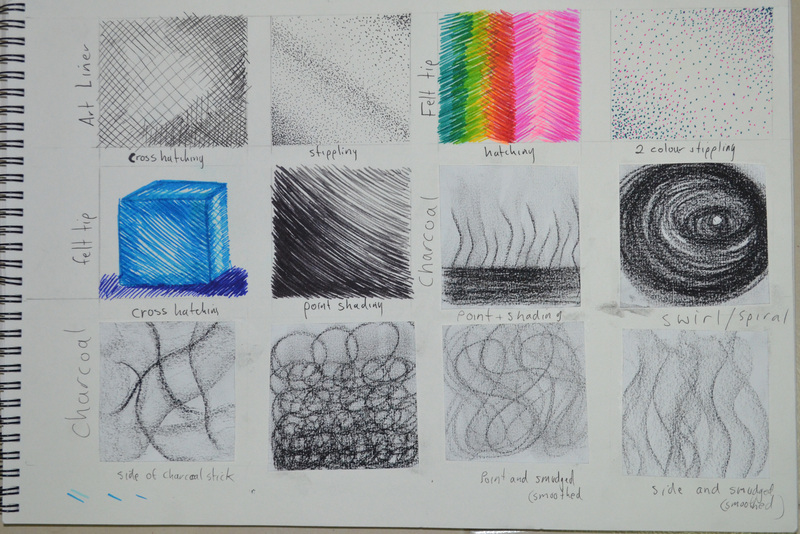 Varying between 2B, 3B and 4B pencils I managed to use several different mark making techniques to fill up the boxes in my sketch book. I found that graphite pencil was a generally good all rounder but particularly great for hatching, point shading, smoothing and squirkling, however to carry out stippling effectively it seems to help if you know which pencil to use with the weight and tooth of the paper. I can see how graphite pencils are also great for cross-hatching but unfortunately I need a lot more practise at this, it was a technique that I found difficult especially when applying long strokes to large areas where I had to make another stroke to carry on the line which was far from seamless. Another technique which my art teacher taught me at high school was shading with small circles that gradually get bigger, I found that this technique didn’t work well with graphite pencils and seemed to be reserved for pen drawing. Colour pencils are also quite a good all-rounder and you can carry out most of the same techniques as you can with the graphite pencils but using 2 or three colours for hatching rather than applying pressure to the strokes give your drawings a better sense of depth. Stippling was also a pleasure especially when using two colours but the points had to be kept sharp or your pencil had to stay longer on the paper drawing the dots to create the stippled effect. I’ve always stayed away from colour pencils lacking the confidence to use them but this exercise inspired me to do my first colour sketches. I moved onto pen starting off with Bic biros which I found were great for squirkling creating a very lively effect with good depth but again this is a medium that I need a lot more practise with and should have done so before filling in the squares I attempted two spheres with squirkling and hatching and failed on both, simply because the with the squirkling creating obvious rows between each row. Hatching with biro just shows how much I need to work at this technique not being able to cheat by smoothing the lines in. Biro was great however for shading with the gradual circles technique I learnt at school as were the Artliner drawing pens. The Artliner drawing pens were superb for stippling and I can see how they can be good for other techniques such as hatching and cross-hatching but again like the biro they showed me the bare truth, that I really need to work on my hatching technique. This was also true for the felt tips. Charcoal is a medium that I had never worked with until ‘Holding Pens and Pencils’ exercise but I do love the texture that each technique gives you, it’s a just a shame that when working on this exercise I only had large sticks of hard compressed charcoal so was limited by this. Since then I have found a great art supplies shop at Silpakorn University so I am really looking forward to the next exercise. I didn’t expect this exercise to be as difficult as it was, as a teenager I would spend most of my nights doodling to bring out ideas and still do to this day; but when asked to clear my mind and think of ‘water, flowers, buildings…‘ I found myself locked into my surroundings and the tall concrete buildings of Bangkok. I decided that the best way to approach the exercise was to limit the different drawing tools I used in each doodle as the position of my hand while holding a pen or pencil would smudge other soft mediums. And so I had to decide what I would use to create each image beforehand. After the first two or three I was still struggling to break free and every time I thought I succeeded in the task at hand the Bangkok skyline would make another appearance so I decided to take time-out for a couple of days. Round two was a lot easier, I chose to start off with charcoal which was something that I had never used until exercise 1 ‘Holding Pens and Pencils‘. 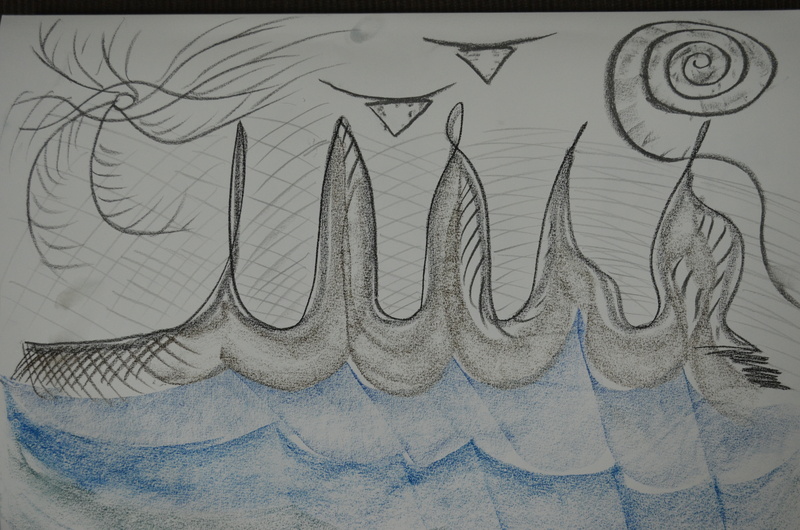 The charcoal was great for creating swooping lines and swirls which helped me to get away from the squares and rectangles I’d been creating in previous doodles while still thinking about buildings and water. I thoroughly enjoyed creating the next few doodles and it was great to try out new mediums such as graphite sticks and hard pastels. This was a great exercise for getting to my newly purchased drawing tools, nib pens, Conté crayons, soft pastels, oil pastels, charcoal, solid graphite pencils and drawing pens plus a few more. 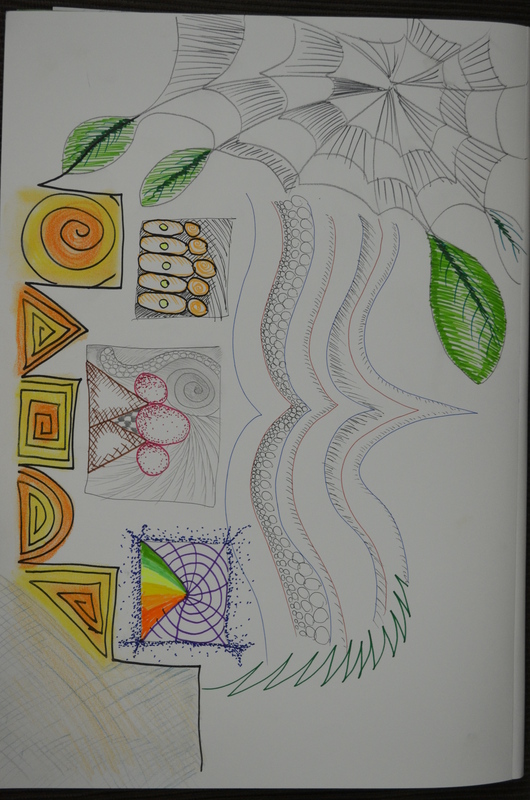 The aim was to practise holding pens and pencils in different ways to see how they affect the way we approach drawing and the difference they make to our mark-making and how we draw. 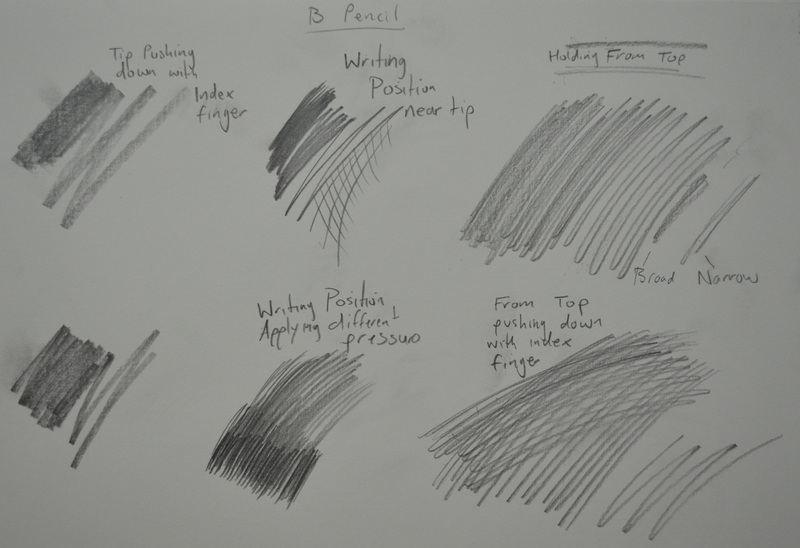 Starting off with a B sketching pencil I found that holding the pen close to the end in what I would call the natural writing position gives you the most control with the wrist acting as the pivot for movement which allows you to make marks more precisely. The conclusion I got from the making large strokes is that this technique is limited to drawing outlines. Holding the pencil at the tip and pushing down with the index-finger gave me broad, soft lines, full of texture, amplified by the texture of the paper in my sketch book. It can be used for larger strokes by using the elbow as a pivot but it is undoubtedly better for covering small areas. By holding the pencil at the very top and letting it dangle between my fingers created different marks, sometimes narrow other times broad and more textured, depending on the angle of the pencil which changed depending on how close my hand was to the paper. Holding the pencil in this manner gives you softer marks and allows for a longer stroke, although not precise this seems to be the most expressive. I took note of the mood that strokes made by the different ways of holding the pencil seemed to express, calm, aggressive etc. I noticed that by applying more pressure and moving in larger strokes that the mood seemed to change. I tried holding several types of pens in the same three ways and found that only my Artliner drawing pens and Bic ballpoints changed in stroke and texture when gripping them in different ways. The size of the stroke from my 1.0 mm marker altered only slightly and the nib pen using different sized nibs and Chinese ink only allowed me to make downward strokes. The nib pen is probably my least favourite at the moment but in time I shall learn how to use it successfully. 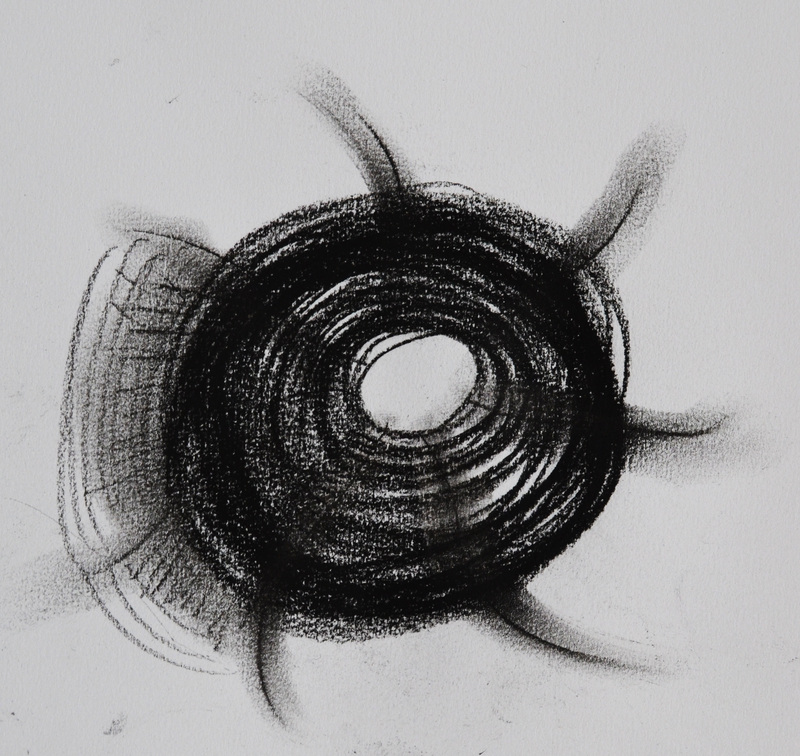 It was the first time I had used charcoal or Conté crayons but I found that they both make very similar marks. Using the edge of the tip of both gives a very strong line whilst using the side of both produces wide, soft, textured marks. It was also the first time I had used soft pastels and oil pastels and found that the oil pastels had although making a similar mark to soft pastels felt more like a wax crayon while drawing on the paper. The soft pastels like the charcoal and Conté and charcoal can be smoothed in with the finger but I found them very messy and I shall have to practise how to use these along with fixative spray. 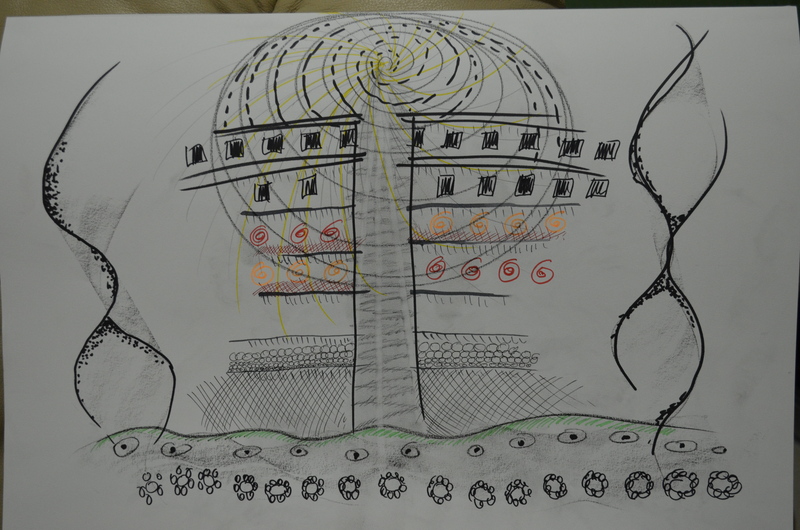 This Mark A Smith's learning log for the OCA course Drawing Skills Level 1, student number 511564. Make your life as you want it to be!! Do not settle for mediocre! We do good things for kids!